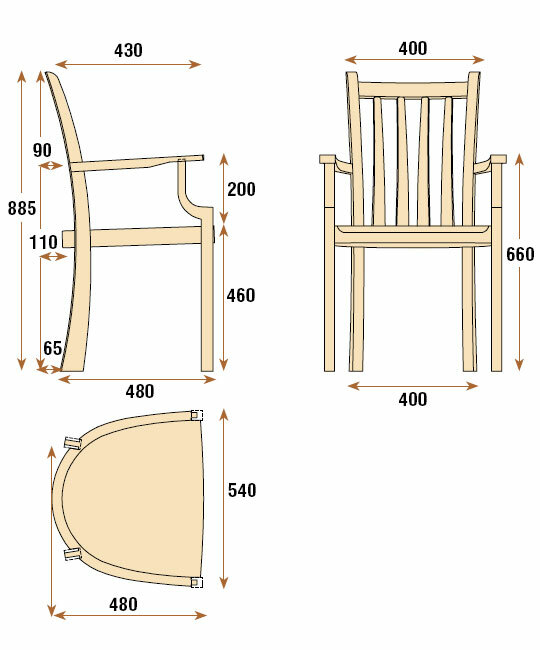 Carvers, or dining chairs with armrests, are frequently supplied in pairs, with the remainder of the set having no armrests. In these egalitarian days, this seems unfair as most people prefer to use dining chairs with armrests, so this project looks at creating a set of four carvers. Apart from the obvious function of providing somewhere to rest your arms during a relaxing meal, the armrests offer additional support while you sit or stand, as well as being handles for lifting and moving the chairs. From the maker's point of view, armrests on dining chairs provide additional bracing, removing the need for rails beneath the seat. In my view, this makes carvers a more satisfactory construction than their armless brethren. 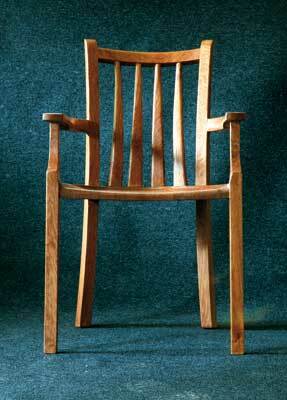 Sets of chairs provide the maker and the buyer with some economies of scale compared to a single item of furniture. 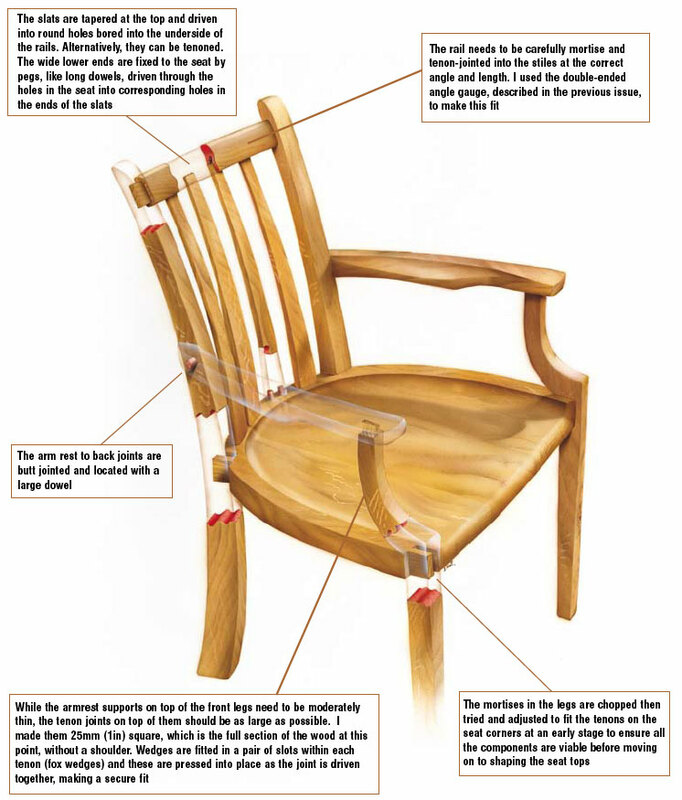 While the chairs are still individually made, the processes of using templates to make identical parts, repeated measurements and angles for the joints, and repeated set-ups for simple jigs, all reduce the making time per chair. While making a set of four chairs - or half a dozen - is by no means mass production, there is some satisfaction to be gained from the repeated methods and the planning involved that improve the efficiency of the processes. There is also some economy in the use of materials gained from nesting the cutout patterns for curved chair components from one inside another. The wood used for this project was brown oak to match the trestle table in the last project I made for this series. 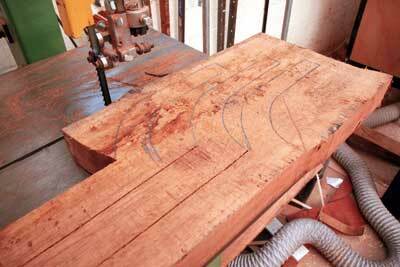 The wood I used had been sawn to a nominal 50mm (2in) thickness and air dried, then kilned. Golden oak or other coarse-grained native hardwoods would be suitable. Excessive seasonal movement in a wide wooden seat like the ones made for these chairs, could seriously distort the chair and weaken the joints. The moisture content needs to be stable at around 10% to 12% for equilibrium with the air in a dry, warm house. Using thick timber such as this means changes in moisture content are slow. This is a mixed blessing - it has the advantage that the finished chair will be less responsive to short-term seasonal changes but the disadvantage is that you need to wait longer to ensure the wood is acclimatised to the workshop before cutting it. The brown oak is sawn into short butts and the solid seats are made from three of these butts, edge jointed together to make the required width. 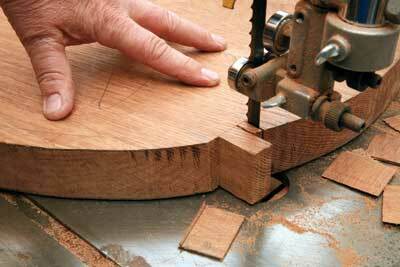 Edges are jointed in the same way as we have previously used, by hand planing pairs of edges clamped together. Because the width of a pair of edges is approaching 100mm (4in), the jointer plane, which is much narrower, must be angled so that the sole sits flat across the pair of edges. The edges are pressed together dry and checked with a desk lamp behind to make sure there is no chink of light sneaking through, especially towards the ends where the plane could easily dip by accident. The seats are then glued-up using a modern waterproof PVA type adhesive that forms cross-link bonds and would not be weakened by any accidental spillages. Sash cramps are used to hold the joints together. of the seat first on the bandsaw, leaving plenty of excess around each joint, returning later to fine-tune the joint shapes and angles on the bandsaw, with the assistance of sharp chisels. The legs, arms and rails are also bandsawn from the solid 50mm (2in) thick material, 'nesting' similarly shaped parts inside one another to avoid excess wastage and make best use of the timber. 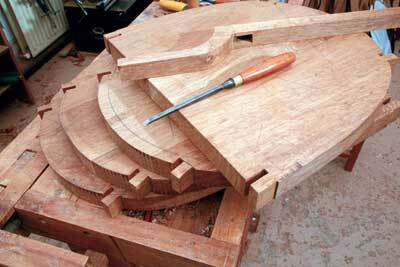 After bandsawing, the components are all trimmed back to the shape of the template using the router table or spindle moulder technique described here. 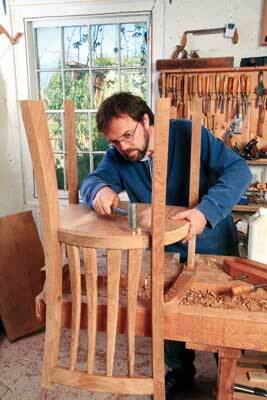 The mortises in the legs are chopped then tried and adjusted to fit the tenons on the seat corners at an early stage to ensure all the components are viable before moving on to shaping the seat tops. 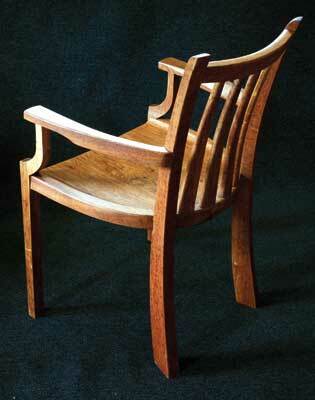 The seats for these chairs are shaped from the solid to form gently curved hollows with more tightly curved edges. Make this shape in two stages: first route the tightly curved channel around the edge then use an Arbortech cutter - which is a steel disk surrounded by chainsaw type teeth - with a guided motion to remove the bulk material, as I will explain below. A template made from MDF or ply, being the same shape as the seat but considerably smaller, is used to guide the router as it forms a round-bottomed groove inside the edges of the seats. The router cutter has a 25mm (1in) radius, which is about as large as I care to use in a hand-held router. 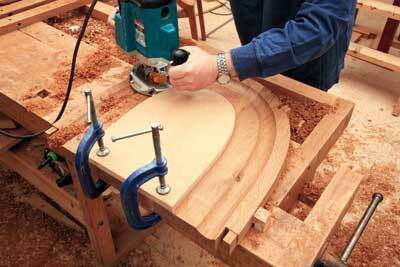 Make the groove in a series of shallower cuts so there is no risk of the machine being dragged off-course. Having used the router and Arbortech to hollow out the seat, you will need to further shape and smooth the sitting surface. This could be done with a chair maker's travisher or a convex spokeshave, but I prefer to use a wooden plane that I have shaped for the purpose to be convex in both directions. Wooden planes are readily available from junk-shops or internet auctions. 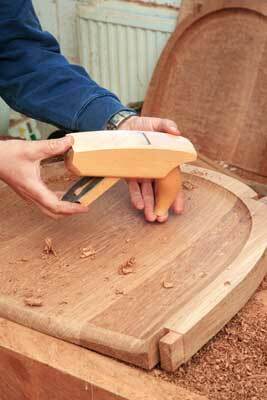 With the blade removed, the shape of the sole can be shaped with a block plane. The blade then needs grinding to a corresponding curve before you re-fit it. The backs of these dining chairs have a top rail fitted between the back legs or 'stiles', and a set of tapered slats running between the rail and the seat. 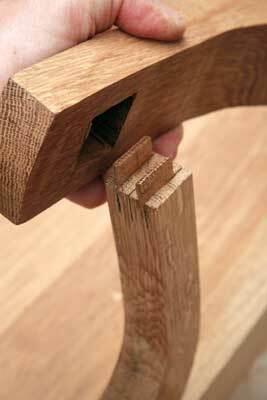 The rail needs to be carefully mortise and tenon jointed into the stiles at the correct angle and length. I used the double-ended angle gauge to make this fit. The slats are tapered at the top and driven into round holes bored into the underside of the rails. The wide lower ends are fixed to the seat by pegs, like long dowels, driven through the holes in the seat into corresponding holes in the ends of the slats. 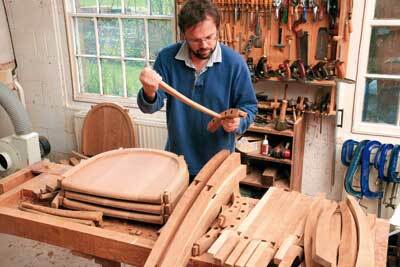 The seats and legs are glued-up and pulled together with band cramps, which apply considerable pressure without distorting the shape of the chair. 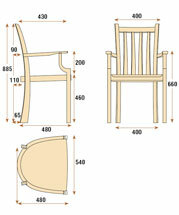 The front legs are curved from front to back and tapered on the inside to support the arms above the seat level. 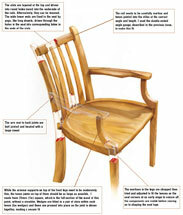 Armrests will be used for lifting these heavy chairs, so it is important their joints are not prone to working loose. While the armrest supports on top of the front legs need to be moderately thin, the tenon joints on top of them should be as large as possible. I made them 25mm (1in) square, which is the full section of the wood at this point, without a shoulder. Wedges are fitted in a pair of slots within each tenon - fox wedges - and these are pressed into place as the joint is driven together, making a secure fit. As with most furniture, it is normal to shape and prepare the surfaces of components for chairs before joining and gluing them together. Having fitted all the parts together, there will be further sanding required which can be done with a random orbit power tool, or by hand following the direction of the wood grain. The edges are all chamfered either with a wide chamfer which forms part of the shaping, or an edge chamfer which provides a smooth splinter-free line and catches the light. The surfaces of chairs are inevitably subject to wear though contact with clothes and hands, while dining chairs may be subject to spillages as well. The options to cope with this are either to make the surface finish so thick and impervious that it is practically indestructible, or to use an oil finish that can be supplemented and maintained over the years. The latter option provides a friendlier 'woody' as opposed to 'plastic' finish, so I would encourage clients to choose this. Apply Danish oil generously to all surfaces then wipe off with a dry cotton rag after about twenty minutes, before the oil has a chance to coagulate on the surface. When the first coat has dried after a day or two, the grain will be rough and need de-nibbing again with fine sandpaper. 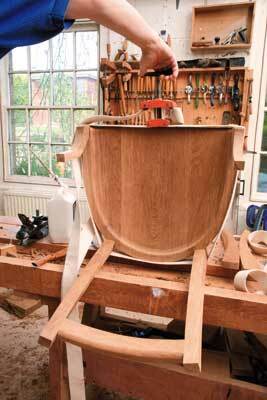 A further two or three coats of oil over the following week will bring the chairs to a good satin finish. 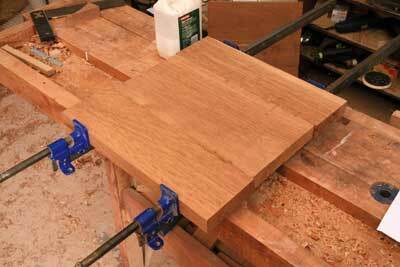 "A further two or three coats of oil over the following week will bring the chairs to a good satin finish"
With the routed groove forming a channel around the outside of the seat, position and clamp the seat on the workbench beneath a beam or secure hook, some 2000mm (78in) above. A wire rope - I used a length of plastic covered steel washing line - is passed over the beam or a suitable hook, and looped around the spindle guard of an Arbortech cutter, fitted in an angle-grinder motor. The ends of the steel rope can be raised or lowered then clamped onto the bench to fix the height of the cutter disk. Use this system to guide the movement of the Arbortech cutter as you sweep it in a 2000mm radius arc, forming the hollowed out base of the seat. Particular care is needed at the end of each sweep, as you want the arc of the Arbortech cut to blend into the groove previously cut with the large radius router. The pendulum will, of course, swing fore and aft as well as side to side, producing a hollow curved in both directions. I recommend practicing this technique on scrap before taking risks with expensive and carefully prepared wood.